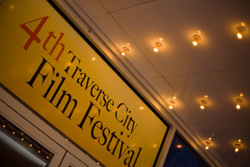 The 4th Traverse City Film Festival drew to a close on Sunday. I shot a few events this year, but also took more time to see movies and enjoy the parties. I've posted some of my photos in the TCFF 08 album. I tried to get to at least one movie a day this year. One movie that really impressed me was Profit Motive and the Whispering Wind, a film based on Howard Zinn's book, A People's History of the United States, a book that I read a few years ago, which is definitely worth a read. The film is basically an hour long montage of historical markers and headstones, following many of the figures, movements and protests chronicled in Zinn's book. The film has no voice overs, no music, simply the ambient sounds of locations where the footage was shot. I took a couple of things away from this movie. Given that there was no dialog, the movie really allows the viewer to fill in the blanks, and come up with their own conclusions regarding what is being presented. This was an aspect of the film that I really enjoyed. Far too often, much of what we are shown in typical documentaries, even on the news, is laden with some selection of dramatic music, and typically provides far less latitude for the viewer to roam with their own thoughts within what is being presented. I'm not sure when the trend started, but it seems like many of the major US-based news networks have to have a title and theme song for every catastrophe... (Fox's "america's challenge" - case in point), but that's another topic I suppose. I've always been one that's believed you should have a well-balanced diet of information sources, if not just for the fact that you're likely to get a more well rounded view by doing so, but also due to the fact that much of what seems to be coming out of the news these days is over dramatized and factually generalized to the point of being benign, and consequently less thought provoking. There are a few exceptions to this, of course. The essence of Zinn's book, and the film as well, highlights historical situations where people or groups, typically oppressed in some manner, have exerted influence on government or institutions for the betterment of their living situations or for equal treatment in society, among other things. The result is a view of history from a grassroots level, rather than one that is viewed from those in positions of power. It is a good record of what can be accomplished when people unite and drive political progress. The movie was a thought provoking piece, especially when taking into account the current political atmosphere surrounding the upcoming US elections, in particular the prominent theme of "change", which all of the candidates have latched on to at some point with varying degrees of success. While there has been a great deal of excitement and momentum surrounding a singular person promising sweeping changes, it's important to remember that change often doesn't come from one person, and that people must have some involvement in the political process to create the kind of momentum needed to chip away at the stagnant perches held by many of the serving politicians. It is encouraging to see such a recent influx of new voters and people interested in the political process, especially considering (and likely a result of) the course of the past few years. That said, such momentum should be sustained beyond the general election for that very reason. Additionally, it would be an utter disappointment in the face of such a renewed political interest if there is no accountability for maintaining and following through on the promises of such changes that are the foundation of a candidate's campaign. I had the chance to watch a few other notable films, though in terms of what I was left with at the end of each of them, I would say that this film was the most satisfying. Sadly, I didn't get to catch any of the later films at The State, and a few of the other headline movies, but there is always next year. It was good to see this festival from both sides this year. As far as my own artwork - I've been fairly busy with a few new things, meditating on some new ideas. I feel like I'm at some strange point where I require some level of reinvention. It happens from time to time. I do have a pretty exciting semi-new project in the works, which I will announce next month. I have also decided that this project will also be the topic of my December solo show as well. More to come on that.